Ground cherries or gooseberry salsa fixings! 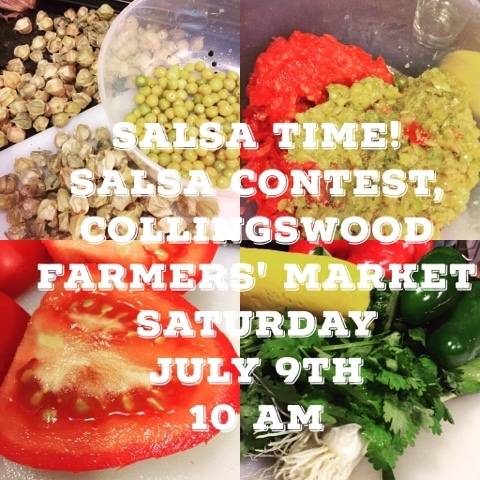 Saturday, July 9th - I'll be one of the judges for the salsa making contest at the Collingswood Farmers' Market, 10 am, in Collingswood, NJ. CONTESTANTS MUST REGISTER. Salsa Contest at the Market SAT JUL 09. I'm sorry I can't enter, in years past, I will do a fire-roasted salsas with peaches; garden vegetable salsa w/zucchinni and squash added; ground cherry or gooseberries; three pepper salsa; tomatillo salsa. I love salsa and it's an excellent way to start to can; you can put up a few jars each week from your farmers' market finds!